Many people in Polynesian and Southeast Asian countries enjoy growing and eating taro. This plant plays a key role in Hawaiian culture. And it plays an integral role in traditional Hawaiian cuisine. Hawaiian taro, or kalo, comes from the plant family of araceae. It has a rich nutty flavor and is a vegetable root of a light purple hue. Ancient Hawaiians ate taro not only as a nutritional side, but also used it for its healing and medicinal properties. However, due to its high content of calcium oxalate (said to cause kidney stones), one can only eat taro well cooked. Cooked taro is a good source of potassium and contains vitamin C, E, the B vitamins, copper and magnesium. The green taro leaves are rich with vitamins A and C and a fair amount of protein. In Hawaii, people use taro leaves for wrapping laulaus. This is a dish of steamed pork or chicken with salted butterfish (black cod) or pork fat added for flavor. One makes laulau by first wrapping it in taro leaves and then again in ti leaves. Taro roots require substantial amounts of water in order to grow. As such, the tropical climate of the Hawaiian Islands is ideal for the cultivation of this root. The leafy plant flourishes in a wet environment, whether through frequent rain or in flooded fields. Farmers grow taro in two ways, in a dry patch or in an irrigated patch. The irrigated fields or lo’i are constantly submersed in several inches of water. This provides the plants with maximal hydration during their growth. The Hanalei Valley on Kauai is a good example of this. This valley has some of the most expansive taro patches in Hawaii. 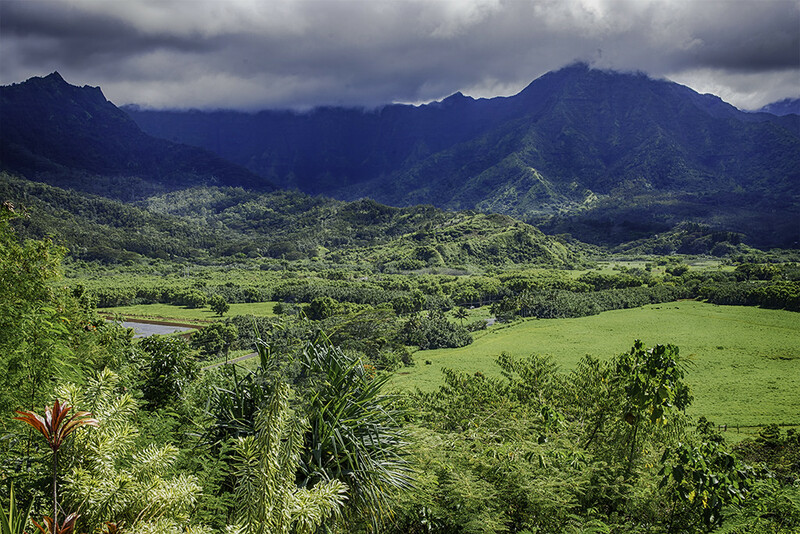 Hanalei Valley, where farmers grow Hawaiian taro. In Hawaii, people use wetland taro to make poi. This is the most popular form of eating taro. 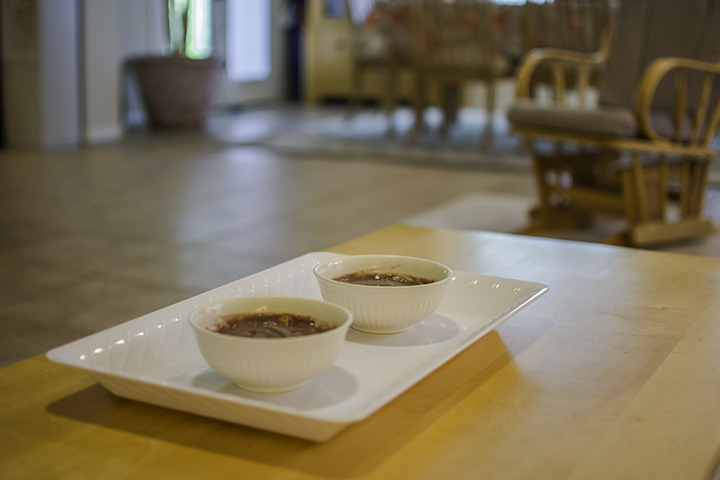 Poi is an ancient Hawaiian dish made from the paste of baked or steamed taro that has been fermented. You always find this dish at traditional luaus or Hawaiian food restaurants. Others use dry land taro to make taro chips or add it into Chinese dishes. According to history, the significance of Hawaiian taro is far more than just a delicious Polynesian staple. 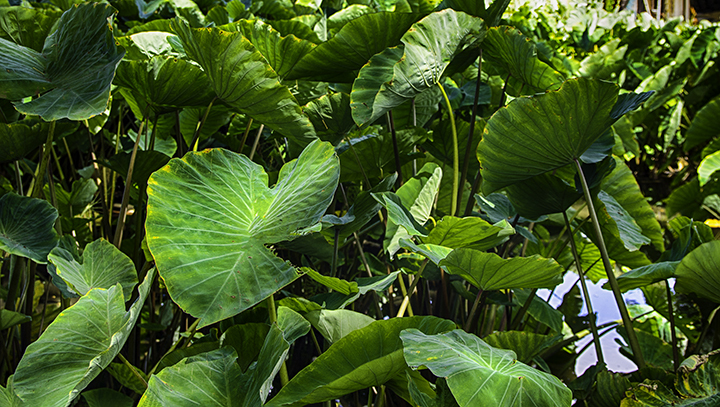 As legend goes, taro played a significant role in Hawaii’s creation story. Originally the father heaven, or sky, had a stillborn child with mother earth. When they buried the child, a taro plant grew in its place. The second son of the earth and sky became the father of all Hawaiians. He revered the taro plant as one would an older brother. This love of taro was then passed down to all Hawaiian descendants and is still a respected tradition. Historically, because of the important role taro played in Hawaiian cuisine, only men could prepare a dish containing taro. You can eat taro can right after cooking it. It has a taste somewhat similar to a sweet potato. One can also prepare it as a bread, similar to “potato” bread. Also, some have used it as a veggie-burger option. But you can also use this Hawaii-grown root in other unexpected areas. It is not often that people use a vegetable or root as the chosen flavor for trendy desserts. But frozen yogurt stores often feature sweet taro as a frozen yogurt flavor. Some places add taro powder to give a hint of sweetness in teas and smoothies. This vegetable’s savor proves to be a favorite as a crunchy day-time snack, a staple at a luau, a delicious addition to tea or a refreshing dessert. It is clear to see why the Hawaiians loved taro. There are so many ways to enjoy it.